Ample Hills Creamery is an ice cream shop at Disney’s BoardWalk Inn at Walt Disney World. This review features ice cream photos, or thoughts on the 16 flavors served at Ample Hills, and our take on the value for money of this chic new ice cream spot. In this case, “chic” isn’t just randomly just tossed around–Ample Hills is a trendy spot with a few locations in the New York City area. Ample Hills Creamery is anything but garden variety. For too long, the landscape of artisan ice cream has been dominated by pairs of poetic, pun-obsessed east coast hippies who seem to worship cows, and strive to operate conscientious businesses. The founders of Ample Hills change all of that by…um…well??? Maybe not. Whether it be Ben & Jerry or Brian & Jackie, those east coasters know dairy. Compared to the double scoop cones under $5 at Plaza Ice Cream Parlor or the under $4 soft serve at Auntie Gravity’s, this is a difficult price to stomach. That is, until you consider Ample Hills is a premium, handmade product (I don’t know if they pasteurize on-site like the other Ample Hills locations, though) whereas the other aforementioned Disney spots are basically sourcing their product from gallon tubs at Publix. Sure, the Taste of Tiffins plate might cost ~$10 more than the Double Angus Cheeseburger at Restaurantosaurus (…which is currently $17.29…?!?!? ), but the latter is McPick 2 quality, whereas the former is amazing from start to finish. Now is the time where I’d hit you with a Warren Buffett or Oscar Wilde quote to really drive home the distinction between price and value, but I know the highly intelligent readers of this blog already know the difference. That’s the kicker for me, and why I think putting prices into context is important. The single scoop cone at Ample Hills does cost a lot, and arguably is overpriced even for what it is. However, from my perspective, the value proposition at Ample Hills Creamery is still better than places serving the same stuff I could get literally anywhere–including the local grocery store. Putting Ample Hills Creamery into proper context, the Ooey Gooey Butter Cake Sundae is what you’re going to want to order, and that will set you back $8.50. (It’s also better value than a single scoop.) Compared to the Coupe du Dimanche at L’Artisan des Glaces in Epcot or the No Way Jose at Beaches & Cream Soda Shop over at Beach Club (even if the latter is using normal ice cream, the final product there is delicious), you’re looking at similar quality and price points. Personal preference is going to vary in terms of which one of the 3 serves the best overall product and experience, but those nearby ice cream spots are appropriate measuring sticks. This is a bit of a mixed bag. The inside of the shop has that Ben & Jerry’s vibe: too whimsical to be described as hipster, but with that same general tone and style. It’s a cute, a colorful, vintage-ish aesthetic that works fine on the BoardWalk, but isn’t going to blow anyone’s mind. Service from the “Amployees” (I’m not sure what their actual status is–Cast Members or Amployees, I assume some sort of hybrid) was exceptional, as everyone we encountered was incredibly friendly, and eager to have us sample (yes, they actively encouraged it) as many flavors as we wanted. A much better experience than other ice cream spots at Walt Disney World, where cycling through crowds is the top priority. In this regard, we potentially benefitted from the fact that both of our visits to Ample Hills Creamery were in the middle of the day when no one else was behind us in line. We asked about the lack of crowds, and they stated that their big rush is post-IllumiNations, when the entire queue tends to fill. I’d hazard a guess that you won’t encounter the same enthusiasm about trying samples at that time as you would mid-afternoon. The downside to the mid-afternoon visit is the heat, coupled with lack of indoor seating. On our first visit, we ate outside, which wouldn’t be a problem (to the contrary, it would be a pleasant experience overlooking Crescent Lake) October through April, but in the summer humidity, even the ice cream wasn’t enough to keep us cool. Consequently, we ate our ice cream inside the second visit, hovering around the area where utensils are dispensed. 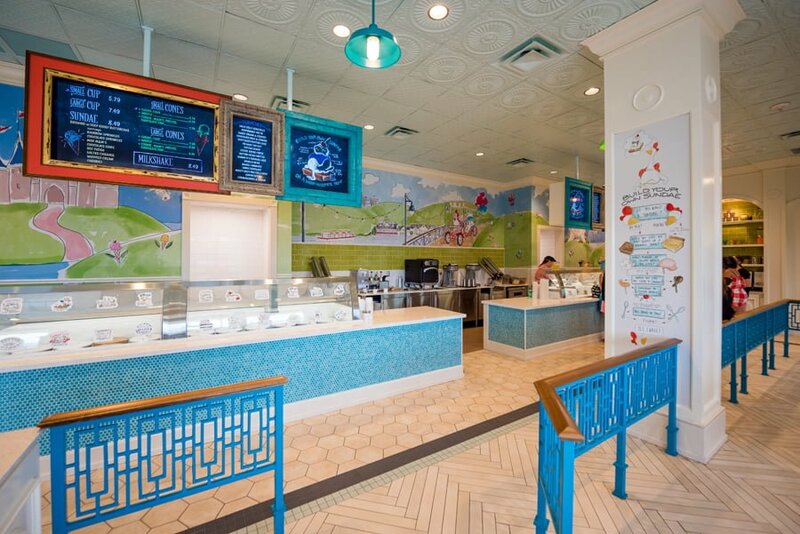 Beaches & Cream definitely has Ample Hills Creamery beat in this regard. Over the course of our two visits, we ordered or sampled all of the 16 flavors on the menu. A lot of this is going to come down to personal preference, obviously, but what struck me was that each flavor brought something unique to the table. This was usually accomplished via the large chunks of “stuff” in the ice cream, which gave interesting twists to familiar flavors. I’m not going to fixate on every single flavor, but there are a few that stuck out. First, Sally Sells Seashells Ice Cream, the flavor that’s unique to Disney’s BoardWalk Inn. Since it’s unique, I was predisposed to ordering this one. However, the sample was underwhelming as compared to other options. It didn’t pack the same punch as did many of the other flavors (although that’s probably to be expected as a “lighter” option given its ingredients), so I decided to skip it. Your mileage may vary. At the other end of the spectrum was Ooey Gooey Butter Cake. The absolute best flavor at Ample Hills. So creamery and sweet, with chunks of soft butter cake to add even more sweetness. I upped the ante further, ordering this as a butter cake sundae topped with caramel and whipped cream. Scratch what I said about personal preference above. This sundae is the undisputed star of the Ample Hills Creamery menu, and if anyone disagrees, they’re wrong. The flavor is so unique as compared to a normal sundae, and the ingredients are so good. Even those who believe in moderation will question the idea of sharing this sweet dessert. Sarah tried a PB Wins the Cup cone that first visit, and she absolutely loved it, preferring it to my Ooey Gooey Butter Cake. This is one of those rare occasions where I am right and she is wrong–she’s totally wrong here (let’s keep that between us, though). PB Wins the Cup is exceptional–better than 95% of ice cream flavors anywhere, but the notion that it’s better than Ooey Gooey (or “The O.G.” as everyone should be calling it) is laughable. Overall, Ample Hills Creamery joins the elite ice cream options at Walt Disney World, with premium pricing–but also a premium product. Whether it’s better than L’Artisan des Glaces or Beaches & Cream will come down to your preferences, but just being in the same league as those two says a lot. Even with its high prices, Ample Hills Creamery is now in our regular rotation of places to visit, and we consider it a worthwhile “vacation splurge” due to an exceptional, unique product that provides good value for money. Do you agree that Ample Hills Creamery is a worthwhile splurge at Walt Disney World? Or, is it overpriced? Which flavors did you like or dislike? Looking forward to stopping here? Share your thoughts in the comments! I LOVE Ample Hills! I have enjoyed the ooey gooey sundae too! I thought that was my favorite flavor until I tried the pecan one…..I can’t recall the name but WOW! I also have to add we were there just two weeks ago and they offered complimentary toppings on a cup of ice cream. Good stuff. I had no idea Ample Hills existed in Disney. We live just a five minute walk from one of their Brooklyn, NY locations. I was thinking of having an early birthday treat there before I leave for Disney, but now I can have it while I’m on vacation; what a dream! Their peppermint pattie is incredible. I wonder if they’ve got salted crack caramel, my absolute favorite. I finally had the chance to try ample hills. Amazingly good ice cream, worth the money for sure. Have to agree with Sarah here about the PB (sorry Tom ;), it was delicious! I went twice during my trip and it was great both times. The ooey gooey butter cake ice cream is hands down the best ice cream that I’ve ever had — and I’ve eaten a lot of ice cream over the years! So good!! We stayed at the Beach Club and visited Ample Hills frequently – especially once we realized we could use a snack credit for a scoop! The ice cream is really delicious. My only complaint is that we go to Disney in the summer and it is HOT. There isn’t really any indoor seating so you have to eat your ice cream fast outside or it will melt. We will continue to visit this place since YC/BC is our Disney home! Great review Tom, I’ve made sure to plan a stop here to check it out for myself on my upcoming December trip. My only nitpick about the review is you seem very unwilling to tell us what you thought about the Ooey Gooey Butter Cake ice cream. I kept reading the review and everytime it seemed like you might tell us if you liked it you sorta held back. Oh well I guess I’ll just have to try it for myself and see what I think of it. Disney Dining Plan participants should note that a Small Cone or Cup is eligible as a snack credit. See those dots just to the left of the small cup and the small cone on the menu? That’s them! Really looking forward to this place. Wife’s not an ice cream fan, so I’ve concocted a “breakaway” plan that will allow me to pop over for a visit. Boardwalk “east” has really seen some positive, exciting changes recently. I have to agree with Tom — the Ooey Gooey Butter cake is amazing. There are chunks of the cake that give the ice cream great texture. Instead of turning to soggy soup, the cake was pretty firm and almost a little crunchy. I will say the scoops are large so $6 seems like a fair price to me. Neither my mom nor I could finish our single scoops (after grazing most of the day) so you could easily get away with sharing if you have smaller stomachs (aka people who are not Tom Bricker). I’ll have to stop by when it’s quieter and sample some more! I had the same question as the 1 above. Do they participate in dining plan? Any offerings for a snack credit? Thanks. Can you use a snack credit to purchase a scoop? I’ve been lucky enough to have Ample Hills as a part of my normal like here in NYC. They’re beloved by the community, and my mind was blown when I heard about their shop opening in WDW. I personally think the homemade base is worth every single penny. I’ve never lived ice cream, until Ample Hills. Now, I don’t waste my time (um..calories) eating any other ice cream. Ample Hills or bust! i first heard of Ample Hills a few months before the last Star Wars film. They released a series of Star Wars flavors. I didn’t try those but recalled the place and I ordered several of their regular flavors when I was stumped for a Christmas gift – the ice cream is pricy and with shipping costs even more but she loved it. She also didn’t share… But knowing where Ice Cream ranked with her that was expected so I did ordered two flavors for me. One was the butter cake so I have to agree with your review. The other was the Sweet As Honey. If you haven’t tried it, I’d recommend you sample it but make sure they include pieces of the “honeycomb” as its what makes it special. Thank you so much for doing this review! I have really been looking forward to trying this place in a couple weeks! I’m definitely disappointed about the lack of indoor seating, though. Tom, the peppermint pattie, chocolate milk and cookies all looked great. What did you think of them? Plus, how the heck did they incorporate butter cake into ice cream without it turning into a slimy paste ?